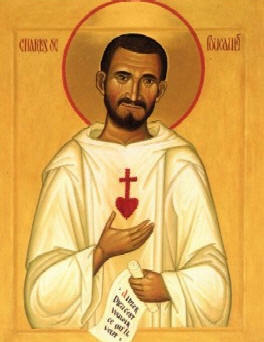 CHARLES DE FOUCAULD (Brother Charles of Jesus) was born in Strasbourg, France on September 15th, 1858. Orphaned at the age of six, he and his sister Marie were raised by their grandfather in whose footsteps he followed by taking up a military career. A pilgrimage to the Holy Land revealed his vocation to him: to follow Jesus in his life at Nazareth.He spent 7 years as a Trappist, first in France and then at Akbès in Syria. Later he began to lead a life of prayer and adoration, alone, near a convent of Poor Clares in Nazareth. On the evening of December 1st 1916, he was killed by a band of marauders who had encircled his house. He had always dreamed of sharing his vocation with others: after having written several rules for religious life, he came to the conclusion that this “life of Nazareth” could be led by all. Today the “spiritual family of Charles de Foucauld” encompasses several associations of the faithful, religious communities and secular institutes for both lay people and priests. Sometime ago, however, I received a personal communication via a White Father with many years experience in North Africa, (who is normally very defensive about the church and unwilling to relate negative comments about saintly figures) that Foucauld’s death was caused in part as revenge for his practice of entertaining handsome young Tuareg men in his hermitage in the evenings. Rumors also suggest that the 15 year old boy was something other than a guard. This source did not affirm any improprieties on Blessed Charles’ part, (and I for one, would not believe them, if they did), but they do suggest a predilection for beautiful young males. The rumors, like swirls of dust in the desert, are difficult to credit because of Charles’ own dissolute early life and female lovers, but then, who knows? Read below of his very close connection to the great Islamic scholar, Louis Massignon, who underwent a great psychological crisis because of his own homosexuality, and who partly attributed his conversion to Christianity to Charles de Foucauld. 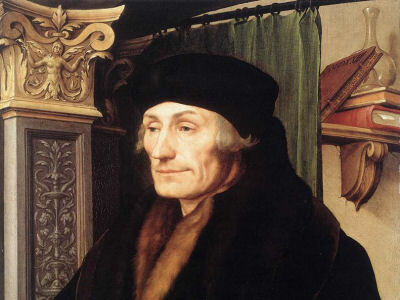 Blessed Charles would later name Massignon the executor of his will and Massignon was responsible for publishing Charles’ Rule for the Little Brothers of Jesus. Theologian Marcella Althaus – Reid died February 20th 2009, after a theological journey that began with the study and practice of liberation theology in the slums of Argentina under the military junta, and ended as Professor of Contextual Theology at Edinburgh University, where her interests included Liberation Theology, Feminist theology and Queer Theology. I have an instinctive personal response to this trajectory – my own journey in faith was strongly coloured by my experience of the Catholic Church under apartheid South Africa as an important force campaigning for justice and peace. As in Argentian, liberation theology was an important influence in the South African Catholic Church, where it transformed into Black theology – and later contextual theology. Like Althaus- Reid, my conviction that Christianity must stand on the side of justice and inclusion for the marginalized has led me to a conviction that this must also include justice in the church, and justice also for the sexually marginalized of all shades: gay, lesbian, trans, bi- or simply queer (in either meaning – sexually non-conformist, or just “strange”). And like her, I too have migrated from a land of southern sun to British damp and cold. So – I could be biased. 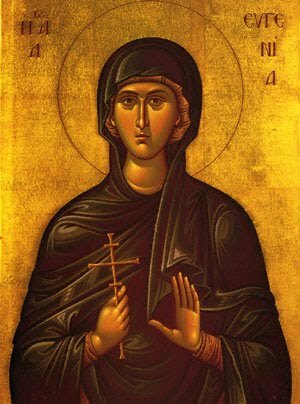 As a theologian, her work was undoubtedly influential – but also highly controversial. Just the titles of her two major books illustrate this: “Indecent Theology”, and “The Queer God”. I love the title and concept “Indecent Theology” (which I have not read), which suggests for me two distinct concepts: that theology should not shrink from tackling concepts that are too often avoided as “indecent”, and simultaneously that in tackling conventional themes, it need not automatically adopt a reverential, deferential submission to received, supposedly authoritative opinion. Her thorough grounding in liberation theology left Althaus – Reid with a firm commitment to the value of base communities, in which ordinary people in small groups can do theology by talking about the influence and impact of God in their lives, in their unique circumstances. The formal, accredited theologians have greater training and academic understanding of the theory of God – but the base communities have real – world experience of their own lives. Both methods of doing theology deserve attention and respect. Hardly anyone has a neutral reaction to the word “queer.” People either love it or hate it. I used to belong to that latter camp until a wiry, effervescent, brilliant Latin American liberation theologian converted me. That theologian’s name was Marcella Althaus-Reid, who passed away on February 20 – far too young and with many more theological and spiritual insights left to offer to a world that desperately needs them. “Queer theology” has been bubbling up in some quarters for a while now, but not quite as long as “queer theory.” Both spark considerable controversy, and sometimes for similar reasons. Usually the word “queer” is enough to send an otherwise congenial dinner party of LGBT people rocking with impassioned disclaimers, hurled history lessons, and proffered pleas for tolerance. In religious circles, gay and lesbian people have been working for decades to carve out a “place at the table” in faith communities that they so rightly deserve. The work can be slow and arduous, which the word “queer” – some strenuously insist – can derail. A few years ago I attended a national gathering of LGBT-affirming ministries where a well-known gay Christian author practically begged his audience of several hundred to refrain from using “that word” in their advocacy work. It simply perpetuates the assumption that we’re different, he explained. That’s exactly the point, as Marcella Althaus-Reid would have chimed in had she been there. We are different. And the only way to do Christian theology is from that place of difference. The “we” for Althaus-Reid didn’t mean only lesbian and gay people, nor the ones so quickly added on later, like bisexuals and transgender folks. “We” are all those who don’t fit the regulatory regimes of both state and church marked by gender, sexuality, race, ethnicity, class, and economics. For her, “queer” maps out a space of resistance to those regimes, not just to oppose but creatively to construct, re-imagine, and envision a different kind of world. Johnson doesn’t spell it out, but her understanding of “queer” was emphatically not restricted to lesbian, gay and trans – it very much included bisexual (which she was herself), and all the varieties of sexual non-conformity – she was one of the few queer theologians to include discussion of S/M sexuality. In reality, Marcella Althaus-Reid constitutes one of the strangest phenomena in the long and diverse history of Christian thought. 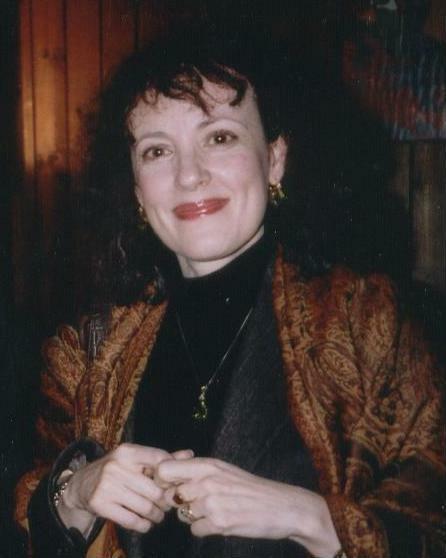 To judge from her published works this lecturer in “Christian ethics” who dismissed the Ten Commandments as “a consensus” reflecting “elite perspectives” (2003:163) was less a spokesperson for the “indecent” or disruptive she is supposed to represent and that might have had it uses, than an unusual kind of atheist and blasphemer whose written wit and reportedly frequent laughter in person barely disguised the extent of the game she must have known she was playing. Within the increasingly effete, too often irrelevant world of theological and Queer studies she found opportunity. Her admirers, and in her last years she had them on an international scale, have been deceived or perhaps never really understood what she wrote – whole chunks of it admitted to be dense, difficult, interdisciplinary and multidisciplinary based. Those who truly understood might have to be considered infidels towards the religion they profess. …. even if Marcella hadn’t returned right answers she had raised pertinent questions based on experiences not to be ignored.